Believe it or not, there's less than a month left in the NBA season. Since most impact rookies won't be heading to the postseason, that means you have a short remaining window to check out some of the most dynamic first-year players we've seen in a long time. Luka Doncic and Trae Young continued their consistent production this week, though it was latecomer Collin Sexton taking the top spot for the second straight week, thanks to more prolific and efficient scoring performances while leading the Cavs to surprising wins over the Bucks and Pistons. Also returning to the rankings with a fury was Kings big man Marvin Bagley III, who looks as dominant as he did before his knee injury. Clippers rookie Shai Gilgeous-Alexander also climbed the ranks, while Knicks forward Kevin Knox re-joins the list after an absence of a few weeks. Is that Collin Sexton or Allen Iverson? OK, maybe a slight exaggeration, but Sexton capped off another brilliant week with a win over the NBA-leading Milwaukee Bucks (sure they didn't have Giannis Antetokounmpo and were on a back-to-back, but still counts). The Cavs won back-to-back games for just the fourth time all season, and Sexton's offense was at the pinnacle of efficiency, shooting 60 percent from the field and making a scorching 13-of-20 from 3-point range. Even more impressive were Sexton's clutch stats (games within five points with five minutes left), scoring 16 points on 6-of-7 shooting and 4-of-5 3-pointers in 10 clutch minutes this week, according to NBA.com. He had zero assists during that time, so he's still not looking to dish, but it's a great sign that he already has the confidence to be a closer -- even if we don't get to see it very often with the tanking Cavs. "This kid is really starting to turn to corner with some really good games against some really good teams," Cavs coach Larry Drew said, according to Marla Ridenour of the Akron Beacon Journal. "He's getting better, and better, and better." The Hawks finished the week strong with a big win over the Jazz, and Young shot relatively well from the field and from the 3-point line. The highlight of his week was a 31-point performance against the stout Celtics defense last Saturday, in which he shot 5-of-8 from the 3-point line. He also racked up 12 assists in a loss to the Rockets on Tuesday, and added 11 more in the win over Utah. Young's shooting has been streaky all year long, but his passing has been consistent -- he's set to join Chris Paul, John Wall and Ben Simmons as the only rookies since 2002 to average more than 7.7 assists per game. Lukamania has tempered just a bit down the stretch, with the Mavs throwing out a lineup nobody would mistake for the 1986 Celtics. Doncic has struggled considerably from deep (4-for-21 this week), but that hasn't stopped him from getting to the free throw line. Perhaps lost in all his clutch shot-making, step-backs and passing wizardry is the fact that Doncic is nearly in the NBA's top 10 in free throw attempts per game this season. According to Basketball Reference, Doncic is one of only 10 guards in NBA history to average at least 6.6 free throws per game as a rookie, and the first since Allen Iverson in 1996-97. Bagley returned from his knee injury last Thursday and it didn't take him long to pick up where he left off. He increased his scoring output in every game, and put up a monster game of 28 points and seven rebounds on 12-for-15 shooting in just 29 minutes in a heartbreaking loss to Brooklyn. He followed that up with a 22-point, 12-rebound, four-block performance in Thursday's win over the Mavericks, while making a career-high three 3-pointers in five attempts. With the Kings, back in action on Saturday against the Suns (10 p.m. ET -- watch on fuboTV with the NBA League Pass extension), out of the playoff race, look for Bagley to get more minutes down the stretch, and maybe even join the starting lineup for the last few weeks if the Kings are ready to turn him loose. After an anomalous 40 percent shooting week, Ayton returned strong in four games this week, shooting 64 percent from the field while averaging a double-double. Defensively, Ayton has picked up at least one blocked shot in six straight games, tying a career-high with three against the Bulls on Monday, which is a great sign for the Suns. Doncic and Young have gotten a lot of the headlines, but it's been a great rookie campaign for the No. 1 overall pick, despite unfortunate circumstances in Phoenix. Halfway through the season it appeared as if Gilgeous-Alexander had hit the rookie wall, but he's burst through it like the Kool-Aid Man to close the season. The Clippers have won eight of their last nine, and are withing striking distance of the No. 5 seed out West, something not many would have envisioned when they traded their best player, Tobias Harris, at the deadline. Gilgeous-Alexander was incredibly efficient this week (55 percent field goals, 56 percent 3-pointers), but his assist total stood out more than anything. He racked up seven dimes against the Bulls on Friday, then set a career high with 10 two nights later against the Nets. He's been adept in the pick-and-roll as a scorer all season, but now he's finding rollers like Ivica Zubac and Montrezl Harrell, and kicking out to L.A.'s new favorite 3-point marksman, Landry Shamet. The Knicks are a complete mess, but the season won't be a total wash if they start to see some development from Knox, who's been wildly inefficient all season. This week he took a step in the right direction, making 46 percent of his field goals and 47 percent of his 3s (up from 36.8 percent FGs and 34.7 percent 3s on the season). 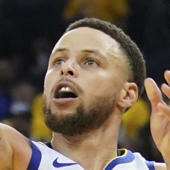 He scored 27 points on 10-of-17 shooting in a whopping 47 minutes in a blowout loss to the Jazz on Wednesday, also pulling down eight rebounds and dishing out three assists. Knox has only notched more than two assists seven times in 65 games this season -- pretty remarkable for someone who plays nearly 30 minutes per game. The Knicks will deal with the passing later, but for now they'll be happy with a bump in scoring efficiency over the final handful of games. Normally known for his energy, hustle and defense, Okogie displayed a scoring ability this week we rarely see. He tied a career high with 21 points in a loss to the Rockets, then followed that up with 19 against the Warriors. He hit three 3-pointers in each game, a feat all the more impressive when you consider he had scored just four total points in the three games before that. Okogie's contributions aren't judged by his point totals, but it's good for the Wolves to know he's capable of outbursts like that every once in a while. Brunson has taken the Mavs' point guard reins after they traded Dennis Smith Jr. to the Knicks, and so far it's worked out beautifully. He's displayed a tremendous floater and runner game (1.042 points per possession on runners, according to Synergy Sports Tech, which puts him among the league leaders), and has offset that by shooting well from the 3-point line in recent weeks. The Mavericks aren't exactly trying to win games these days, but Brunson provides a nice second playmaker when Doncic is off the court. Jackson is getting all the minutes he can handle in the absence of Jrue Holiday, and the rookie (he missed all of last season with an injury after being drafted in 2017) has made the most of it. Nobody's going to confuse him for a full-time NBA starting point guard any time soon, but he's proven capable of running a team and having spurts of explosive scoring. Still just 20 years old, Jackson has definitely shown the potential to be an impact rotation player for years to come, if not eventually more than that.